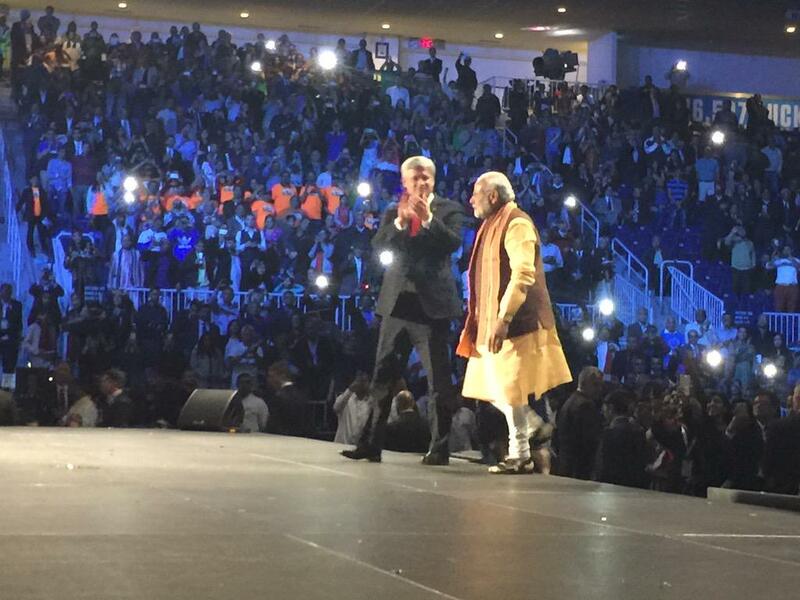 Toronto9web team): PM Narendra Modi addresses the Indian community at the Ricoh Coliseum (Toronto). Prime Minister Narendra Modi and his Canadian counterpart Stephen Harper have agreed to encourage visits by parliamentary delegations of both nations, recognising the role of people-to-people ties in the relationship between New Delhi and Ottawa. 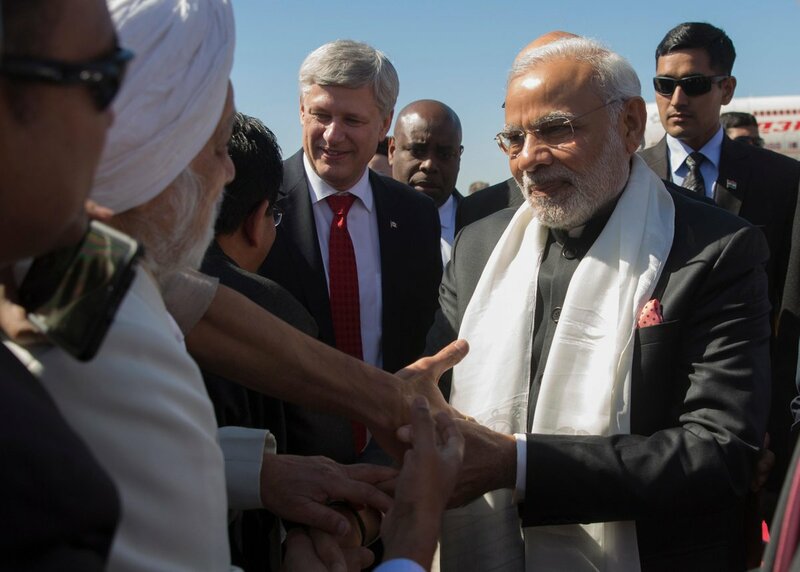 In the joint statement released by the two leaders, Prime Minister Modi and Prime Minister Harper appreciated the growing community of more than one million Canadians of Indian origin and their contributions to both societies. The two leaders emphasised the need to further invigorate bilateral people-to-people contacts and welcomed progress towards the renewal of an MoU on Cultural Cooperation between Canada and India, and Canada’s proposal to hold the Year of Canada in India in 2017. Thank you Toronto! Thank you @pmharper. Unforgettable experience at the Indian Community Programme. India has the strength, what is needed is opportunity: PM Modi. There is a new atmosphere of trust in our nation: Prime Minister Narendra Modi tells Indian diaspora. 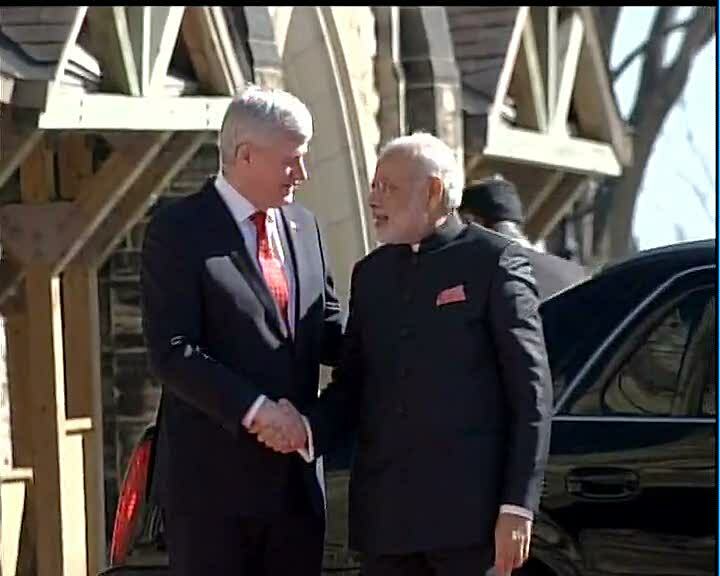 PM Modi and PM Harper arrive at the venue. PM @narendramodi and @pmharper arrive at the venue. Tremendous enthusiasm all around. Prime Minister Narendra Modi arrived at the Toronto Pearson International Airport, travelling from Ottawa with his Canadian counterpart Stephen Harper, along with the latter’s wife Laureen on the same aircraft. Pleased to join thousands of Cdns in welcoming @NarendraModi to Toronto for the second part of his visit to Canada. The two leaders were greeted by a large number of the Indian community in Toronto, who clicked photos and shouted “Modi, Modi”, before shaking hands with their favourite politician. Rare instance. Host & guest fly together. 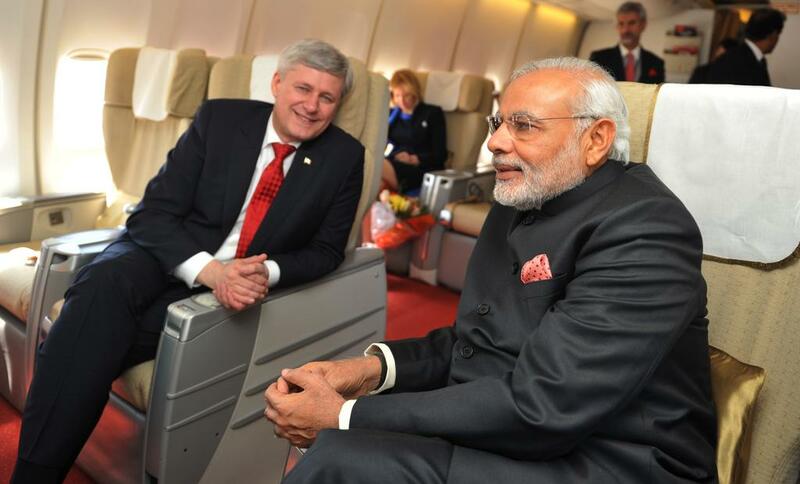 PM @narendramodi invited @pmharper on AI 001 flight Ottawa to Toronto. Prime Minister Modi and Prime Minister Harper also witnessed a troupe of artistes dancing to popular Bollywood tunes, with a large number of Indian and Canadian flags flying. In a break from protocol, Prime Minister Narendra Modi and his Canadian counterpart Stephen Harper, along with the latter’s wife Laureen on Wednesday travelled from Ottawa to Toronto on the same aircraft. In Toronto, Prime Minister Modi will attend a reception hosted by Prime Minister Harper at the Ricoh Colliseum, before attending a dinner hosted by the Indian High Commissioner to Canada Vishnu Prakash for the Indian Diaspora in the North American country. Amid growing threat of terrorism worldwide, Prime Minister Narendra Modi on Wednesday called for a UN resolution to unitedly fight against the menace and its support base as he condemned the terror attack on Canada's Parliament Hill last year. "All those who believe in humanism should unite to fight against terrorism. There is a need for a UN resolution to fight terrorism," Modi said at a joint press conference with his Canadian counterpart Stephen Harper here. He said the threat of terrorism is growing; its shadow extends over cities and lives across the world. "Terrorism has transcended borders. We have to unite to fight terrorism. Terrorism has no race or colour. If we have to fight terrorism then the world should be given a message under the umbrella of UN," said Modi. 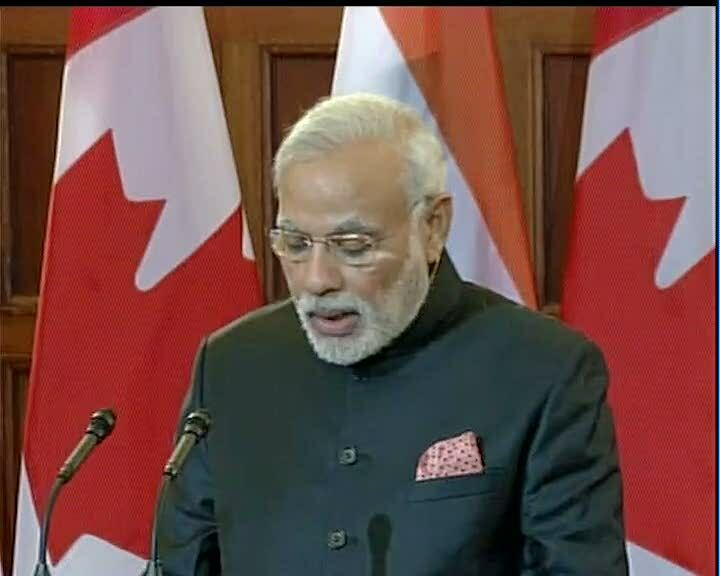 Canada will supply uranium to energy-starved India beginning this year over a period of five years, a decision which was termed as a launch of a new era of bilateral cooperation and mutual trust by Prime Minister Narendra Modi. Under an agreement signed on Wednesday after comprehensive talks Modi had with his Canadian counterpart Stephen Harper, Cameco Corporation will supply 3,000 metric tonnes of uranium over five years to India at an estimated cost of USD 254 million. The supply will start from this year, highly placed sources said. Canada is the third country to supply uranium to India after Russia and Kazakhstan. The supplies will be under the International Atomic Energy Agency (IAEA) safeguards. 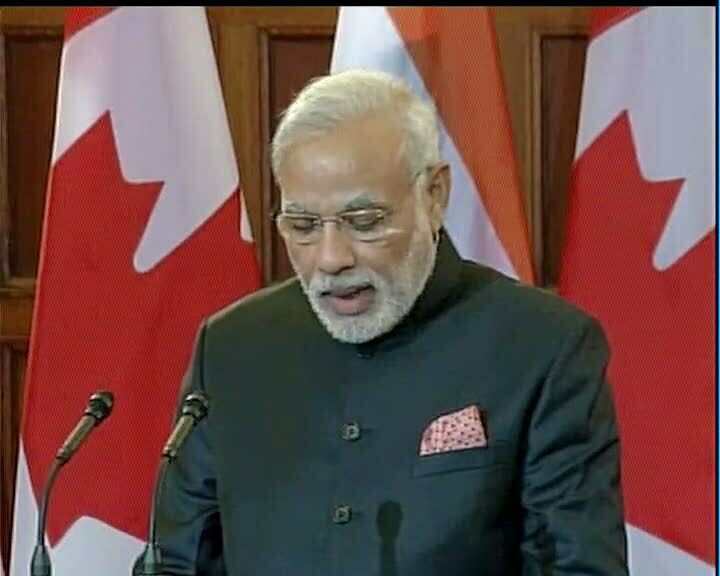 India and Canada will resume commercial cooperation in the civil nuclear energy sector after decades, Prime Minister Narendra Modi said on Wednesday while hoping his visit would act as a "springboard" for taking the bilateral relationship to a new level. "During this visit, our two countries will resume commercial cooperation in civil nuclear energy after decades. This will be a defining symbol of our mutual trust and understanding, and of our willingness to look beyond the boundaries of the past to the opportunities of the future," Modi wrote in an opinion piece in the Canadian paper The Globe and Mail.